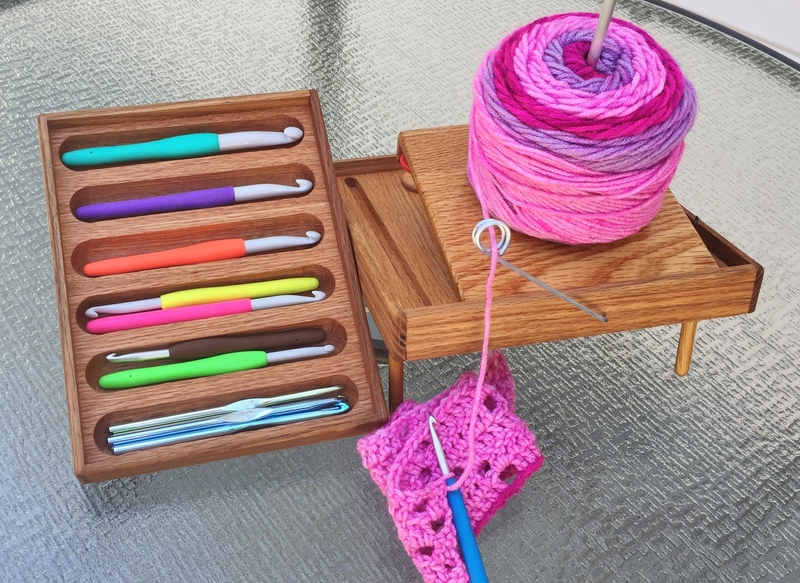 If you are looking for a bedside crochet organizer solution, you’ve come to the right spot! 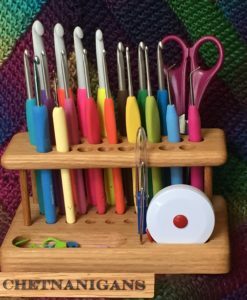 The new Bedside Comfort Crochet Organizer / workstation is the perfect solution to help you organize your fiber art tools while in bed. 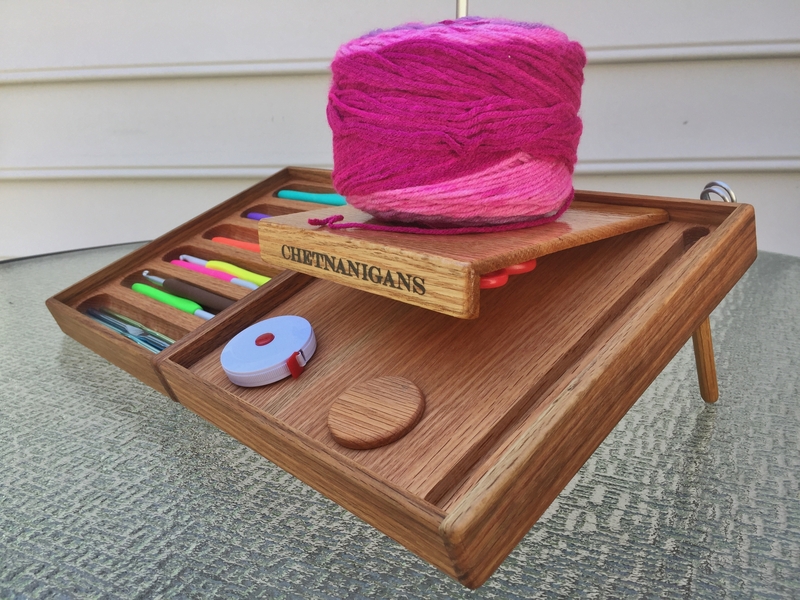 It’s unique design allows you to have both platforms attached, side by side, or you can split the platforms and manage your hooks and your WIP’s independently. 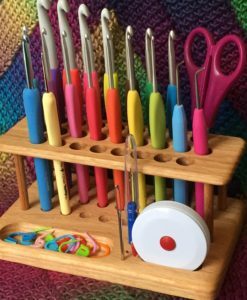 It comes with scissors, a tape measure, a #13 Tapestry needle and a collection of stitch markers, and with their very own storage place on the organizer. 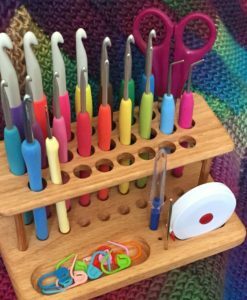 Some of our best new product ideas come straight to us from our customers trying to manage their crochet workflow problems. 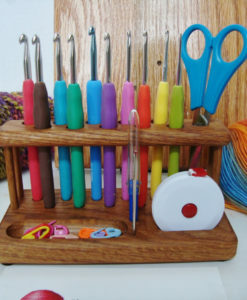 And the Bedside Comfort Organizer is a perfect example of that process. 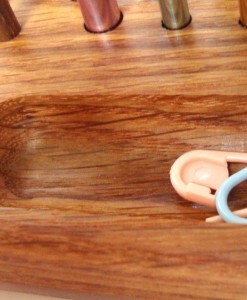 We had a customer reach out to us as some days she is restricted to bed. 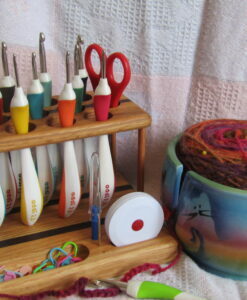 She often spends that day crocheting. 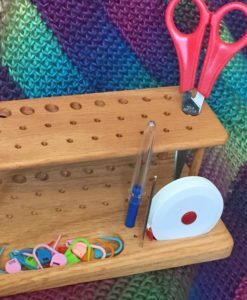 Our more traditional organizer designs wouldn’t work in this situation, so she asked us to design one specific to her needs. 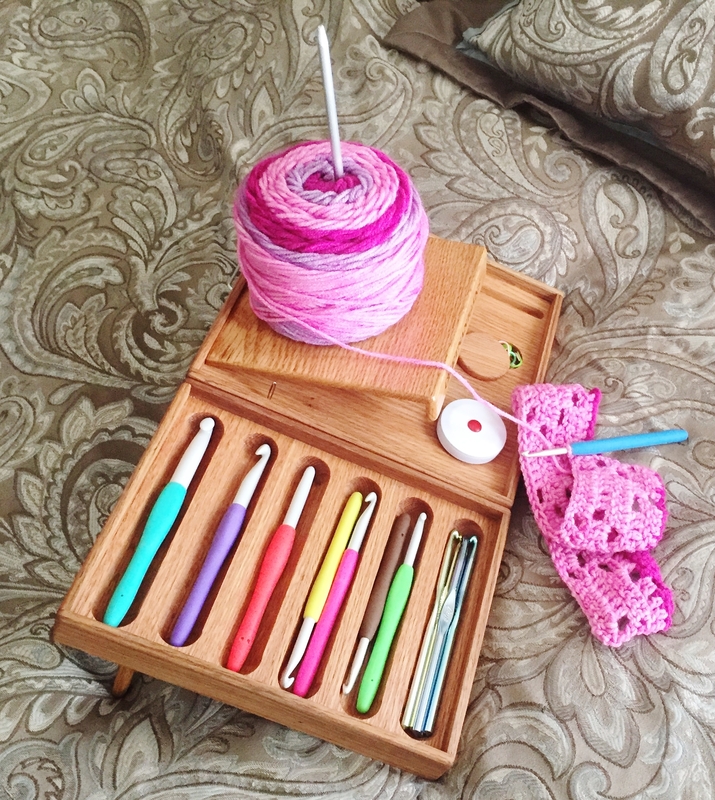 Introducing the Bedside Comfort Crochet Organizer / Workstation! 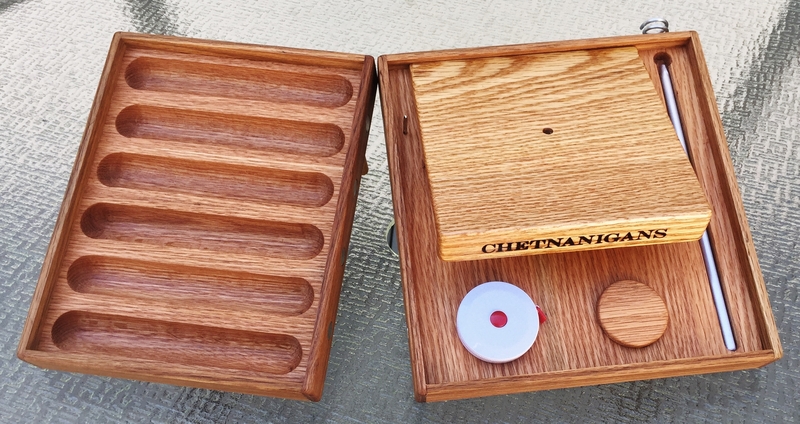 Our newest introduction has some very unique features! 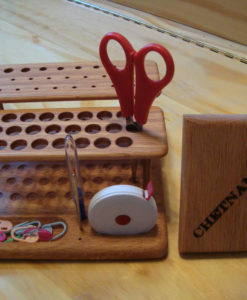 Starting with construction in Red Oak, it consists of two platforms held together with 8 strong magnets. 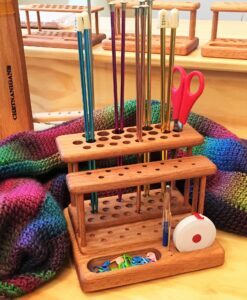 It measures (when attached) about 16″ wide and 9″ high. 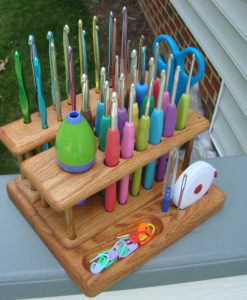 It sits at about a 20 degree angle making your tools, hooks and platform easily accessible. 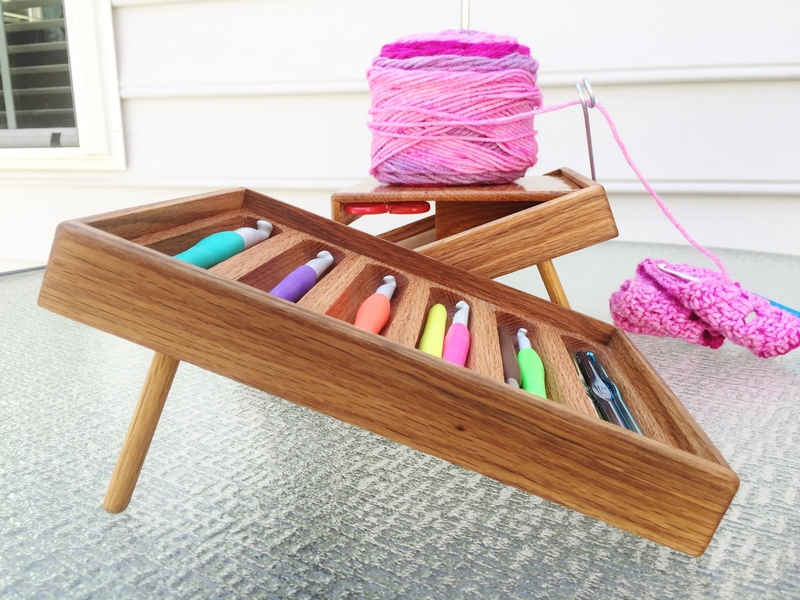 On the left is your hook holder platform consisting of six 1″ troughs to hold up to six ergonomic hooks, dozens of standard hooks or around 12 comfort grip hooks. 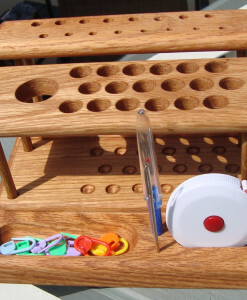 The right side platform is your working platform. 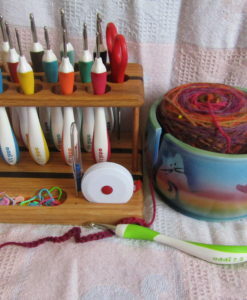 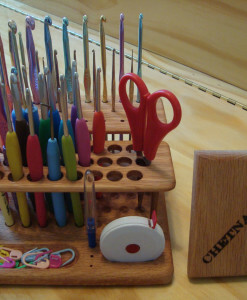 It consists of a SpinOff Platform that you can use to store your skeins, a tapestry needle holder, a scissors magnet to securely hold scissors under the SpinOff platform, a small stitch marker tray with a cover, a spindle trough to hold your yarn spindle and a tape measure magnet to keep your tape measure readily available. 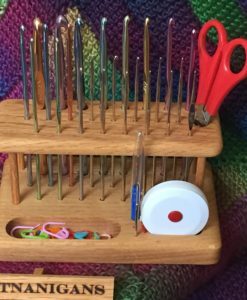 On the rear of the organizer is a yarn eyelet that can be used to thread your yarn through when using it in this manner, or you can simply pull your yarn off the front of the organizer and have it face you when you are crocheting. 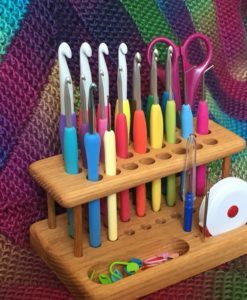 The Bedside Comfort Crochet Organizer / Workstation is a perfect solution for those of us who like to, or need to crochet while lying in bed. 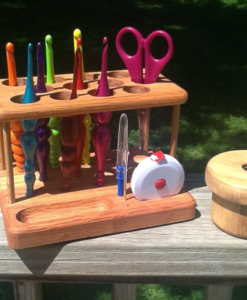 That it splits apart makes it easy to manage and use. 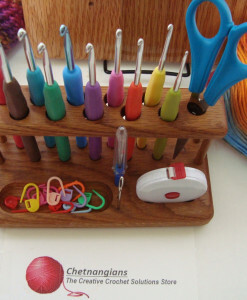 And at under 4 pounds, nearly anyone can manage moving it around their space. 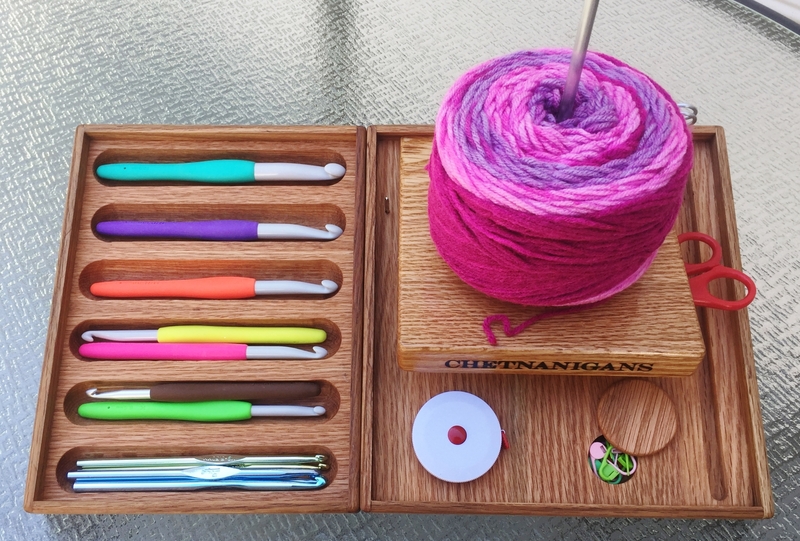 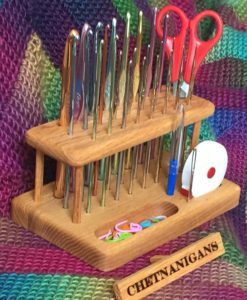 The Organizer ships with a notions kit that includes a 5″ pair of scissors, a collection of stitch markets, a #13 Tapestry needle, and a retractable 60″ tape measure. 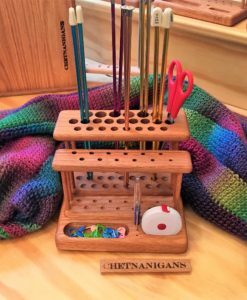 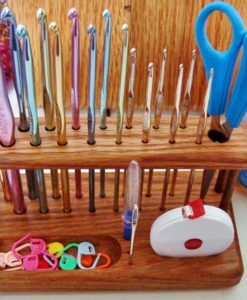 Like all of our offerings, the Bedside Comfort Crochet Organizer / Workstation is crafted with care right here in our little workshop in Midlothian, Virginia, and it is of course built to last many, many years!